Instead of me facing you with another rhetorical question about, what technology we will see in 2018, or how digitalisation is all anyone wants to talk about, let me tell you about what I learnt from semiconductor company Infineon. The big focus for the company here is robotics, and more importantly; how does robotics translate into business opportunities? Well first of all the question is not necessarily how, but why? Infineon is a company that has four types of lead applications so why is robotics such an important focus? Dr Clemens Müller, Director Business Development in Robotics believes the robotics sector is extremely interesting and relevant because they have an increasing presence in day-to-day life. There are only around ten manufacturers in the world that primarily work with robots, and as robots become more like everyday domestic and factory helpers, we need this to increase. Infineon sees itself as a major player in the deployment of Industry 4.0 technology already, and industrial robot technology is intensively used for chip production within the company. Infineon currently use over 170 mobile robots on the fab floors in Dresden, plus a number of other robots behind fences. However the company want to increase this. But back to robots and business, the industry of robotics has the fastest growing products with collaborative robots predicted to grow by 23.3% between 2015 and 2020. The expected growth worldwide will see the install base grow by 12% to around 2.6 units between 2016 and 2019. Finally the market size was $9.8bn as a global market back in 2015, and that number is only going to grow. Basically there are robots everywhere, we started with the traditional industrial robots, which we saw grow to become innovative collaborative robots and now there is an uncounted number of robotic concept prototypes out there, which again is only going to increase with time. And who knows, eventually we may have robots roaming around which currently we cannot even imagine. Dr Müller, however did assure me when I raised the common issue ‘what about the people that these jobs belong to?’ It won’t be a takeover he claimed, just more of a change. Yes there will be less humans needed, but these humans will just need to change jobs, these new robots will create other jobs, and people will soon start to become qualified in a different way. Infineon believes itself to be its own automation expert and therefore can identify the trends in industry. It believes the trends in robotics are growing as robots are easy to use, flexible in handling and sensitive to working environments and learning on tasks. Let’s look at an Infineon robot in further detail, as the company has its own portfolio. As safety is an issue raised by a lot of people, robots have become increasingly popular in the industry. Infineon has addressed this by including safe human/robot or robot/robot collaborations within virtual fences with RADAR or ToF sensors, as it is one of the few vendors in the world to offer safe micro-controllers, hidden behind fences for safety reasons. As you can see above Infineon works with a zone system, where the different zones all hold different warning levels. They are smart with safety and scanning, with any moving object detected and identified. By using scanners in the safety system it is cost effective and includes advanced scanning algorithms such as cameras, and are not subject to damage. Cryptographic measures to ensure that machine is only doing what it is supposed to, and what it has been told to. Encryption on-the-wire/-air safeguards the software updates. Secure logging of machine data to protect against counterfeiting and data manipulation in case of accidents for example. Authentication of users and devices. Permissions restriction to least privilege principle. You can however disturb the robot if something is performing the correct way, this isn’t always the best solution as the robot does not always like this and overwrites the calibration data, which is dangerous. This is where a tool machine interface is useful, as all the tools being used must be certified before being used, by ensuring everything is up to standard so there will be less disruptions. Another product Infineon is working on is a fast, compact and efficient charger with optional active front-end for energy flexibilisation. It has has up to five times higher power density for battery chargers in comparison to just conventional ones, and has up to two times shorter charging time for battery-powered mobile robots (AGVs). There is an optional wireless charging capability, and it offers recuperation (energy recovery) from braking to extend battery operation. With an uninterruptible power supply (UPS) it means actions such as power buffering within the factory grid is simple. 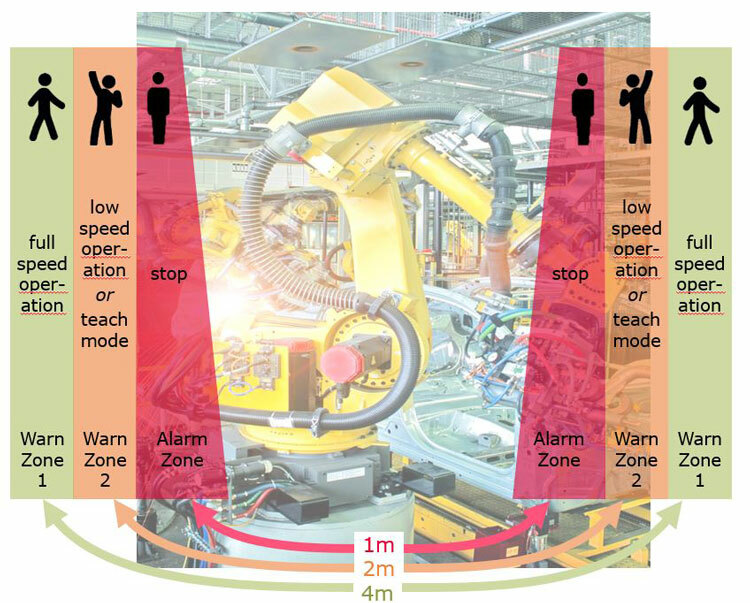 Infineon are always learning from its own automation team, but one thing on the list is logging working hand-in-hand with humans. To have humans around these robots you need to be sure they are all insured, which can be expensive. This is where the black box comes in, if an accident were to occur, the black box will have the data on it, which cannot be over-written and is easily accessed. Another idea that Infineon is implementing is the reduction of wiring within moving robot-arms, from over 27 wires down to two. This means full scalability, a smaller number of special shielded wires; which reduces EMI and mechanical stress, reduces manufacturing efforts and costs for the wiring harnesses, reduces interfaces in rough environmental conditions, and finally the need for only two to three wires in total. 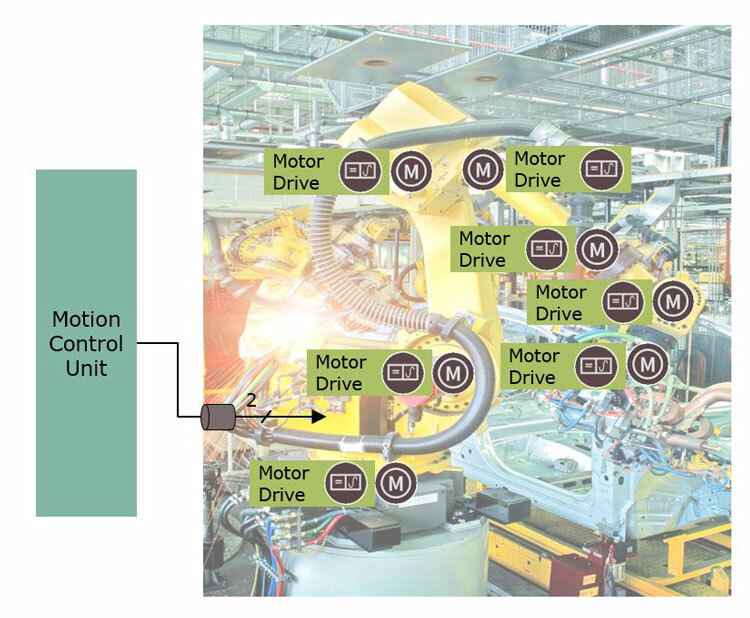 After the automotive industry and its suppliers, Infineon is one of the top users of robot technologies, and with already exsisting building blocks, this allows Infineon to support designing a fully functional system within weeks. Infineon also showcased the ‘scaffolding robot’ prototype collaboration with Munich University start-up KEWAZO, which compromises ready-to-use electronic components by Infineon, with controllers, power switches, gate drivers, sensors and security elements. Dr Müller also took the time to give us some more insight about how Infineon will continue to develop its robots in conjunction with Industry 4.0. Therefore the reduction of wiring efforts within the moving robot arm, as mentioned previously, will significantly reduce costs. With the integration of powerline, the robots will have more of a communication solution with motor control electronics. As it is already an off-the-shelf consumer PLC solution, this could increase performance in the range of standard fieldbus solutions. The full scalability of the solution: It means additional communication nodes can be added non-invasely (for example, the robots effector). There are also no limits on communication, and a significant reduction of wiring and shielding efforts. Infineon plans to set up a full-featured solution prototype, together with its partners. Technology advances with GAN and SIC will support a decentralised driver at a higher power density. What does AI really mean for the future? It’s good to talk… isn’t it?